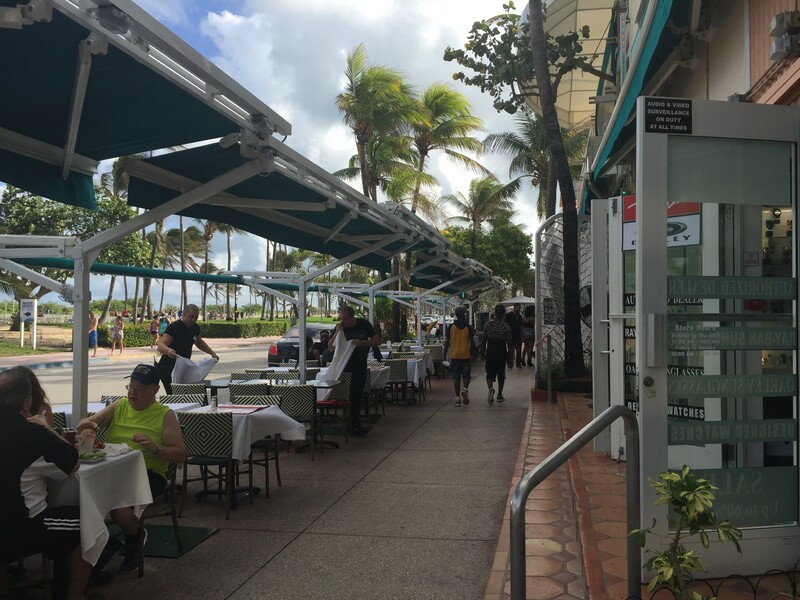 After hearing from businesses on Ocean Drive that said they would be negatively impacted by a decision to force all sidewalk café tables to move to the western portion of the sidewalk on Ocean Drive, the Miami Beach City Commission voted 4-3 this week to reverse itself. When the 10 Point Plan for Ocean Drive was approved, one of the action items was to remove “the gauntlet” between the tables on the east side and the buildings on the west. At the time, exemptions were given to businesses that were unable to move their tables to the west because of issues with blocking entrances to buildings. Three venues now have the exemption: Mango’s Tropical Café, Voodoo Lounge, and the Starlite Hotel and Café (above). The vote in September was 5-1 with Rosen Gonzalez voting no and Michael Grieco absent. She asked the Starlite and Mango’s for an assessment of the effect that moving tables from the east to west side of the sidewalk would have on them. “The Starlite would have to reduce from 37 current seats to 12… that’s not really enough seats to operate, so they’ll probably have to just close their café. Rather than go find a good operator who’s doing something beautiful for 37 seats, they would have to just shut down.” Mango’s, she said, would go from 86 seats to 36 in the summer and from 74 to 30 seats in the winter. “I would much rather see us apply our pressure to what we allow in the sidewalk café permits so that we can have great operators,” she said. Malakoff said, “I don’t think we should rescind but I understand Commissioner Alemán.” She suggested delaying implementation for 120 days to give the operators time to work with code enforcement and the fire department to determine how they could reconfigure their properties so they are not blocking entrances. By a vote of 4-3, the Commission voted to rescind the September vote and to allow the continued exemptions for tables on the eastern portion of the sidewalk. Voting no were Arriola, Levine, and Malakoff. Voting yes, Alemán, Grieco, Rosen Gonzalez, and Micky Steinberg.